The efficiency of any machine or device or process is how much work gets done for each measure of the energy it took to produce that work In lighting; the work is measured in lumens. The electrical energy is measured in watts. So, to determine the efficiency of a light bulb, you need to know two things. One is the amount of light that the light bulb puts out and the other is the amount of electricity it consumes to produce that much light. Both of the values you need to determine the efficiency—the wattage and the lumens, or "initial lumens," should be marked on the packaging that the light bulb comes in. Once you've found those two numbers, all you have to do is divide the number of lumens by the number of watts. That will give you the standard measure of light bulb efficiency, the lumens per watts. Just don't be sure to use the actual wattage of the bulb, not the so-called "equivalency" value. That equivalency number is just a reference to the energy requirements of a standard incandescent light bulb that would produce the same amount of light. Also, try to compare similar types of light bulbs, Comparing an incandescent to a CFL or an LED light bulb can be like comparing apples to oranges. A higher number for lumens per watt means more efficiency: more light produced for less power. A lower number for lumens per watt means less efficiency: less light produced for more power. A typical 40 watt light bulb, say the GE 13257 40W Incandescent Light Bulb, uses 40 watts of electricity to produce 490 lumens. The efficiency of that light bulb is 12.75 lumens per watt. A 40W-equivalent GE spiral CFL Light Bulb uses 10 watts of electricity to put out 580 lumens, so the energy efficiency of that light bulb is 58 lumens per watt. That's more than 4.5 times as efficient as the GE incandescent light bulb. Pretty impressive. A typical 40W-equivalent LED light bulb, the Cree Standard 40W Replacement LED, uses just 6 watts of electricity to produce 450 lumens. That's nearly 75 lumens per watt. That's almost a 33 percent efficiency increase over the efficiency of the spiral CFL from GE. And it's nearly six times as efficient as the GE incandescent light bulb it's replacing. Why Does Lumens per Watt Matter? 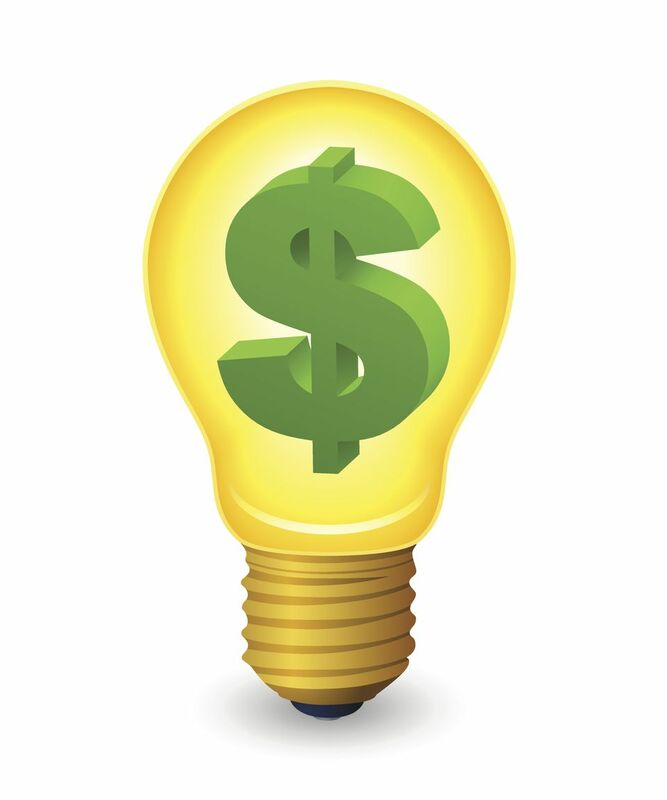 If you wanted to, you could install six 40 watt-equivalent LED light bulbs in place of each 40-watt incandescent bulb you replace and get nearly six times as much light for the same money. Or you could do what most of us do and replace the bulbs one-for-one, and save more than 80 percent of the money you were spending to power your lights. How Does Electricity Work in Your Home?